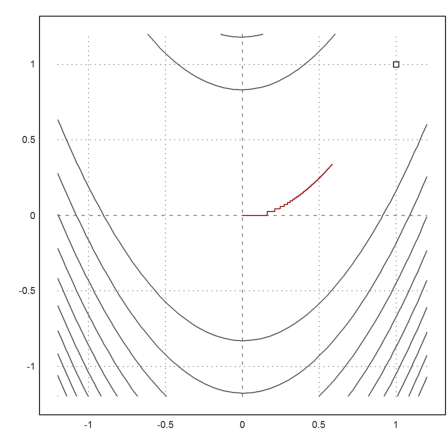 We are going to demonstrate a direction search for the global minimization of a real valued function f. First we define a function, which evaluates another function at x into the direction v. The function vectorizes for t.
Using this, we can search from x into a direction of descent v.
First we establish a value t, such that f(x+tv) is increasing. We do this by doubling the steps t until the values increases. For simplicity, we assume that our function f is defined everywhere. 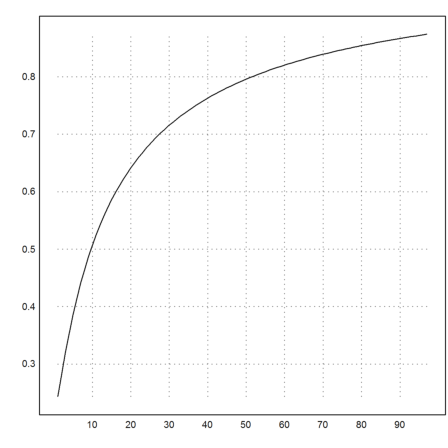 For a gradient method, we need a function and its gradient. We take a very simple example for a first test. 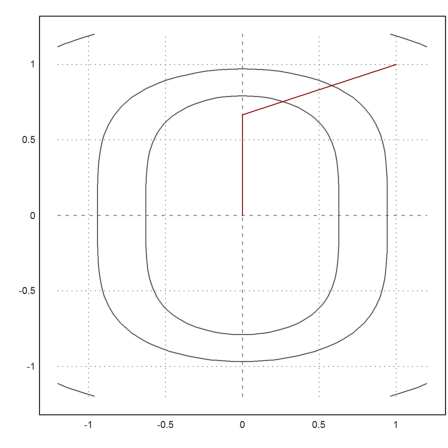 The function vmin minimizes f in a direction v, starting from the point x. It returns the current step size t. This can be used as an initial step size in the next step. But it does not come close to the minimum in (0,0). Not even in two steps. 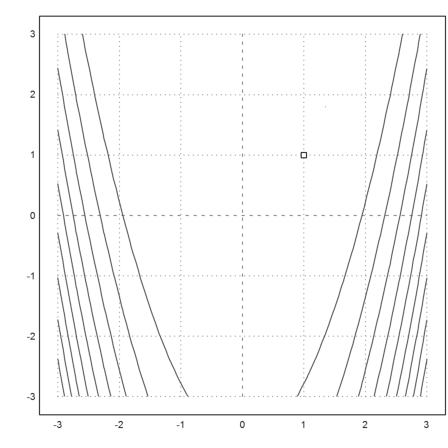 The reason becomes obvious if we look at the following plot, where the level lines of our iterations are shown. We can compute the general inverse Hessian with Maxima, and thus the direction of descent. This yields a very good result in just one step. Indeed, it is easy to see, that the Newton algorithm finishes in just one step for each linear function, and indeed, the gradient is a linear function. There is no need to compute the minimum of f(x+tv) in this case. Let us take another convex function, which is not a quadratic function. We take 100 steps of the gradient method. As we see, the result is not very good. 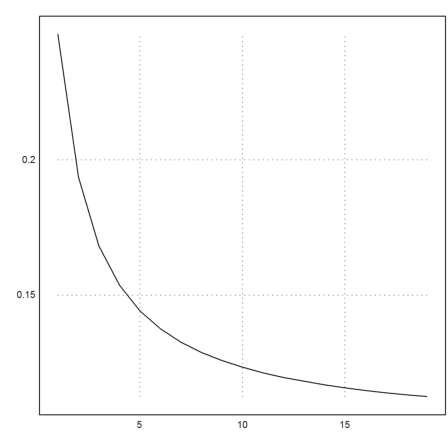 Essentially the function takes a zig-zag-course in direction x, so that the y-value decreases only very slowly. Let us try the Newton direction for this function. Now we get good results after 20 iterations. Here is the logarithmic descent. But the result is not so good, if we take the Newton algorithm itself. 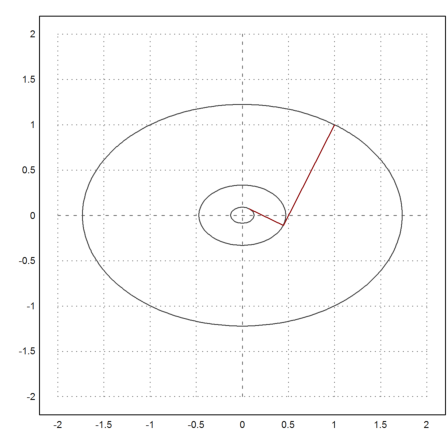 This is in accordance with the observation that the Newton algorithm does not work well for the function f(y)=y^4. Now, we take another function, which is a well known test case. is not convex. It has a banana like behavior. 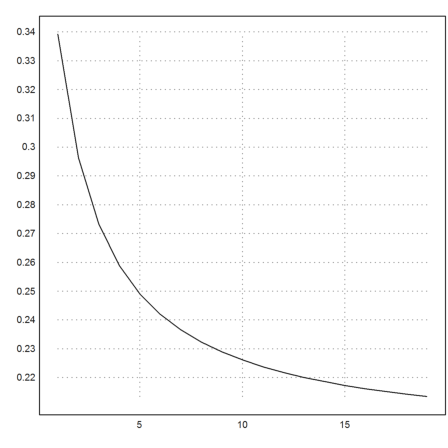 The minimum is obviously in x=y=1. And plot the result. The result does not even come close to the minimum. It takes a terrible step like zig-zag course. Let us try the Newton method. Now we get very good results after 20 iterations. The idea is to start with a basis of directions, and minimize into each once. 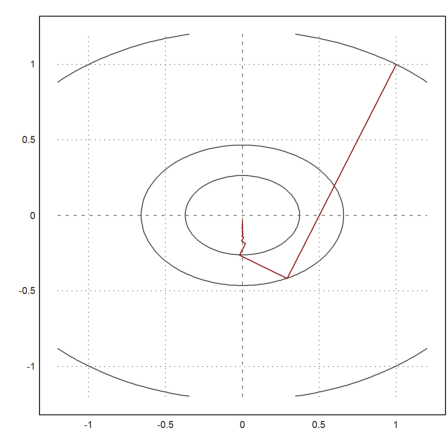 Then replace the best direction with the direction of the total descent into all directions. For the implementation, we use the function brent(), which essentially works like vmin(), but searches into both directions. The method seems to perform very well for a method without derivatives. But one should be aware that each step costs n minimizations. 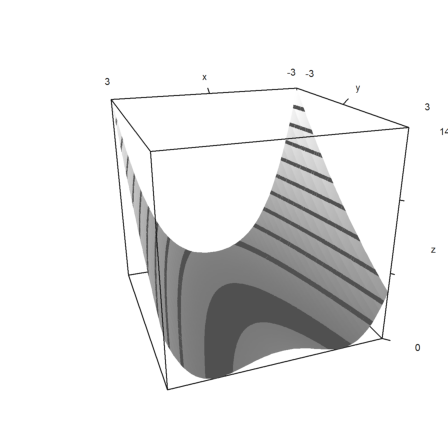 The function is already implemented in Euler in powellmin(). The Nelder Mead method is another method for minimization without derivatives. This demo shows the iterations for the Nelder-Mead minimization process. We need to load helper functions for the demo. 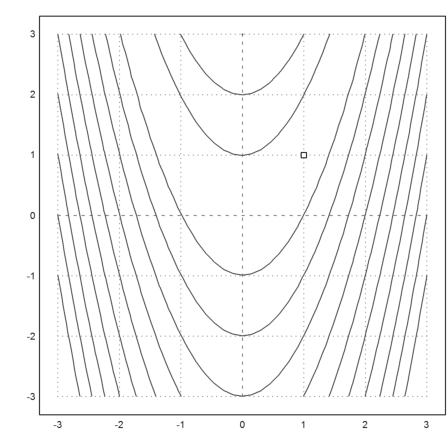 The Rosenbloom banana function, as needed by the Nelder method. The Minimum is in [1,1]. 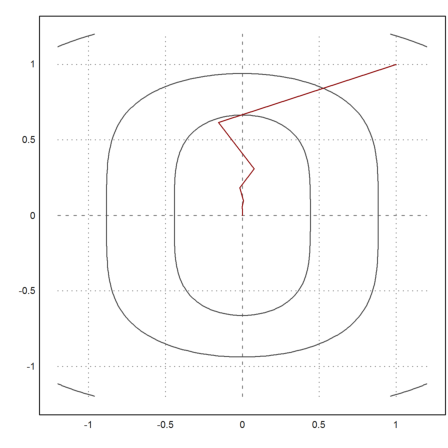 Plot the contour lines of the function in 2D. Add the minimum. The Nelder-Mead method uses simplices. 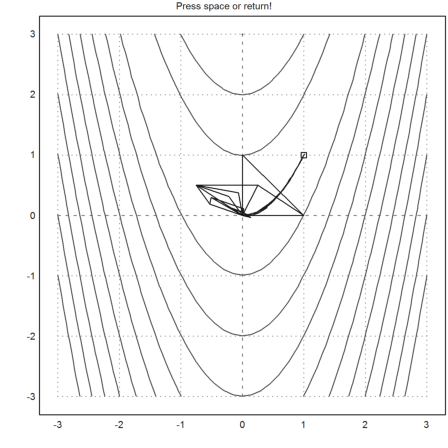 It moves one corner of the simplex, so that simplex moves towards a minimum. Show the iterations of the Nelder-Mead method. Press Return to abort, and Space for the next step.